Once received you are guaranteed safety and protection, no matter what. SPIRITUAL ANSWERS HERE FOUND NOWHERE ELSE! 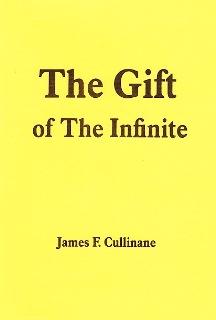 This powerful inspiring booklet by James Cullinan packs more truth than a hundred other thick spiritual books. Rarely has SPIRITUAL TRUTH been explained in so dramatic and personal a way. Whoever is ready for it CAN RECEIVE THE GIFT OF THE INFINITE. No prayers! No rituals! No meditation! WITHIN ITS PAGES ARE TRUTHS SO PROFOUND THAT THE MERE ACT OF READING THEM CREATES A HEALING IN THE READER! We do not have to search for the blessings of the Universe: IT WILL SIMPLY GIVE WHEN WE ARE READY! This is what the author calls The Gift of the Infinite. THIS IS THE ONLY PUBLICATION ANYWHERE WHICH SHOWS HOW TO PREPARE YOURSELF FOR THIS MOST PRECIOUS OF ALL GIFTS. It doesn't matter how disappointed and disillusioned one has been with other spiritual teachings. It matters not how much one has failed. THIS IS THE ONLY PUBLICATION WHICH SHOWS HOW FAILURE AND DISAPPOINTMENT CAN STOP. It is the only one demonstrating HOW UNHAPPINESS CAN BE MADE TO CEASE IN AN INSTANT. NO MATTER HOW DESPERATE ONES CIRCUMSTANCES, A WAY OUT CAN BE FOUND. Despair, in point of fact, can be the prelude to receiving the Gift of the Infinite! The point is to read this booklet again and again. It shows how to change despair into triumph, failure into lasting and thrilling success! Read this booklet again and again and its magic will take hold of you: you will begin to receive THE GIFT OF THE INFINITE! PAIN AND SUFFERING MADE TO CEASE! The blessings and protection of the Universe can be yours  everlastingly! You can enjoy the thrilling feelings of knowing that you are LOVED AND NURTURED BY THE UNIVERSE! Mr Cullinane is the only author who can reveal these powerful truths! Everything he writes you can prove and demonstrate to yourself. Your life can take a new direction. Happiness and peace of mind can become a constant reality! A life free of guilt and anxiety! THIS IS THE ONLY PUBLICATION TO REVEAL THE GIFT OF THE INFINITE. It's priceless. Read this booklet again and again and you will see! It takes you into the soul of Christianity and BEYOND, revealing a truth which eludes it! Read it again and again, and watch the HEALING OF YOUR SOUL AND BODY DAY AFTER DAY. You can enjoy good fortune  and have it MULTIPLIED! You can live in joy and certainty, instead of despair and doubt! YOU WILL FIND WHAT YOU MOST NEED IN THIS POWERFUL AND MOTIVATING BOOKLET. What you need is here! AGAIN AND AGAIN! This is the GIFT OF THE INFINITE: yours to receive, if you only allow it! THIS IS THE ONLY PUBLICATION TO SHOW YOU HOW TO ALLOW IT. ALLOW YOUR SPIRITS TO BE LIFTED, DAY AFTER DAY! ALLOW YOUR PRESENT DESPAIR TO BE REPLACED BY REAL HOPE. ALLOW HOPE TO BE TURNED INTO POSITIVE REALITIES. An end to disillusionment, suffering, and bad luck! Mr Cullinan concedes that religious teachers  not to mention psychologists - would loathe him for what he has revealed here: for it robs them of everything! And within the pages of this booklet is the Gift of Everything: everything you need, the peace and inner power previously denied you. Make no bones about it, this booklet CAN TURN YOU AROUND  if you but let it. The magic of it is in the reading of it again and again, and then finding that the wondrous Gift of the Infinite is entering your life! The magic is in the booklet itself! NO EFFORT IS INVOLVED! JUST READ ITS PAGES AND ALLOW ITS POWER TO AFFECT YOU. And once affected, you will not look back. You will go forward, and keep going forward! No more can others hold you back or demoralize you. EVERYTHING IN THIS BOOKLET CAN BE TRIED AND TESTED FOR YOURSELF! You do not have to take the author's word for any of it! It is so easy! Watch problems shrink and solutions appear! Feel burdens being lifted from your shoulders! Feel like a completely new person. And this is only the beginning! The greatest joy is in the smallest packages. Reading this booklet we could feel its priceless power. Instinctively we knew that anyone who embraces its content is going to become truly blessed. Can you imagine the feeling of knowing that the whole Universe loves you, protects you, nurtures you? THIS FEELING CAN BECOME A WAY OF LIFE. Allow yourself this glorious feeling. Allow yourself the Universes' boundless blessings. No religious belief is required to make any of this work. You don't have to make it work. You just allow it.